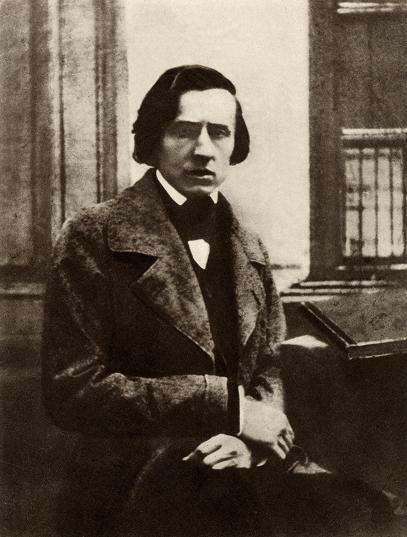 Frederic Chopin was born in Poland of a Polish mother, and his country of origin clearly influenced Chopin to the extent that he wrote many Mazurkas and Polonaises based on Polish dances. The other country he is associated with is France, his father being French and Chopin moving to Paris and spending much of his creative life there. Although often contrasted with the extrovert virtuoso Liszt, the reserved Chopin nevertheless had a creatively important social life in Paris with a number of lady friends. His longest lasting relationship was with the female novelist known as George Sand who dressed as a man. This relationship was important to Chopin, with Sand perhaps acting as a mother figure, and they were together for about 10 years. 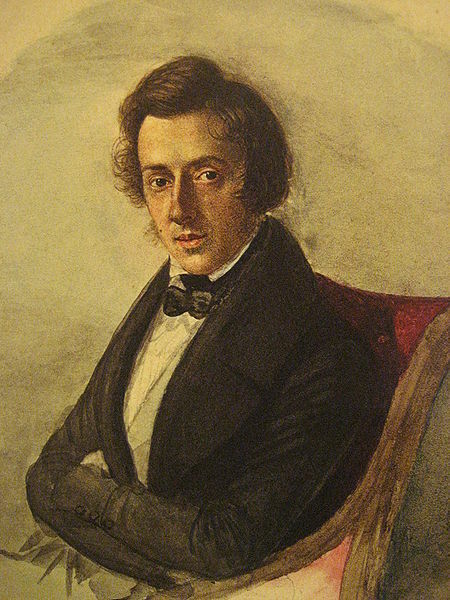 Chopin was not particularly healthy and developed tuberculosis, which he endured for several years before his death at the age of 39. 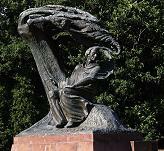 Chopin was a skilled pianist, and a large proportion of his works are for solo piano. Many of these works are fairly short in duration, such as the Preludes, Etudes, Waltzes, Impromptus, Nocturnes and Scherzos, as well as the previously mentioned Polish dance forms of the Mazurka and Polonaise. Chopin also developed a form called the Ballade which is a more extended work, fairly free in style like a stream of consciousness, but with an internal logic. He also wrote a number of multi-movement works including of course several Piano Sonatas. He was quite capable of writing for other instruments and did so at times, his two Piano Concertos (for solo Piano and Orchestra) being obvious examples. Some of Chopin's solo piano works demonstrate a ressemblance to the similar works by the Irish composer John Field, so this was one musical influence. Perhaps the greatest influence in terms of composition was Bach, with Chopin's 24 preludes in all keys clearly mirroring Bach's 48 preludes and fugues. More particularly there is an abstract approach in many of his works (e.g. Preludes and Etudes) which bear a relationship with some of the forms (e.g. Preludes, Inventions and Fugues) that Bach used. These are abstract in the sense that they are heavily structured, but they are far from being emotionless. On the contrary, Chopin played his works with a strong "rubato" (free variations in speed) and his music demands this approach. This gives the performer another dimension of expression which makes Chopin's music very much of the Romantic era. Another famous work with a nickname is the Minute Waltz. (It's an interesting question whether works get a nickname because they are well-liked, or that they become famous simply because someone gives them a nickname, but let's not get into that question!) This name is not particularly appropriate in this case because the waltz lasts much longer than a minute, but the name has stuck. Chopin had originally called this the "Little Dog Waltz" since the inspiration for it was watching his dog chasing his tail. Other Waltzes by Chopin on mfiles are the Minute Waltz's companion Op. 64 No. 2 and Op. 18, Grande Brillante. Chopin also wrote a number of difficult Studies or "Etudes" for piano, and an example of this on mfiles is the Etude in C# minor Op.10 No.4. Another easily recognisable tune from the hand of Chopin is the Funeral March, which is actually a movement from the 2nd of his three piano sonatas. Some pieces were first published after his death including his Nocturne No.20 in C# minor. This is one of 21 Nocturnes of which the most famous is the Nocturne Op.9 No.2 in E-flat major which is also available arranged for guitar and arranged for violin and piano. If the mfiles examples have given you an appetite for more music by Chopin, we can recommend the complete set of piano Preludes as a starting point. This is available from Sheet Music Plus (US) or The Music Room (UK). The complete set of Waltzes is also available from the same sources at Sheet Music Plus (US) or The Music Room (UK). Since the piano is one of the most popular of musical instruments to play and Chopin among the foremost composers for this instrument, there are many websites dedicated to the composer. 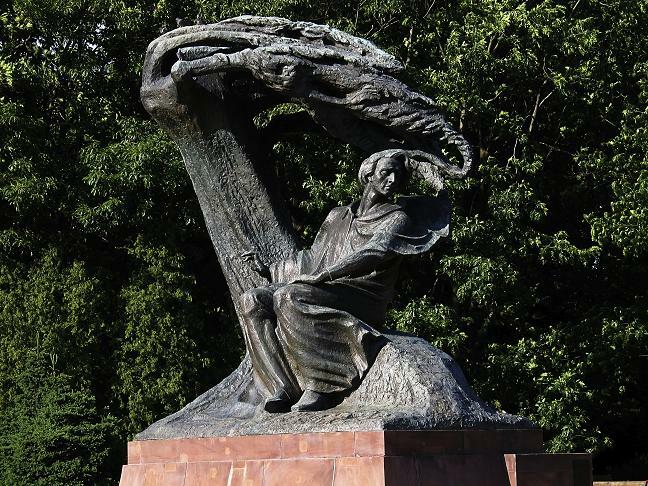 One of the most comprehensive sites is the Chopin Internet Information Centre (in English and Polish) maintained by the Chopin Institute in Warsaw. Click on the Union Jack button for the English language version. 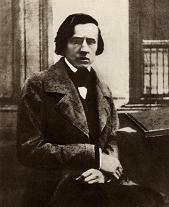 2010 marked the 200th anniversary of Chopin's birth, and there were many Chopin-related celebrations to mark this event. One of the more unusual projects was a full-length animated film called "Project Chopin: The Flying Machine". (Click the image to see a larger version.) The flying machine in the title is a magic piano which takes a pair of children on an adventure to visit the places where Chopin lived and worked. The film also features the pianist Lang Lang and the music accompanying the wordless film comes from the composer's Etudes. To demonstrate the pianist's fun credentials, here is Lang Lang playing the "black keys" etude with an orange on YouTube, and more information about the film and other chopin events held in 2010 and can be found at the official website www.chopin2010.pl/en.